Long before the Marvel Cinematic Universe existed, or color TVs for that matter, Universal enjoyed a lucrative run with their "Classic Monsters" series of films. These films are the classics upon which an entire genre sprouted. If you are a fan of today's horror films, then you must pay an homage for the trailblazing films and filmmakers that led the way. There's only one slight problem with that. In today's ever-increasing digital streaming world, finding these older classic films on services such as Netflix or Amazon Prime is next to impossible. That's because these streaming services tend to ignore anything created before 1980. On one hand, I get it. Their user base is made up mostly of millennials and, quite frankly, most of them have no idea what "Rosebud" even means. And if they do, it's only because it was parodied on The Simpsons. No, most kids today have an irrational fear of black and white movies and I'm perplexed by it. Sure, I can appreciate that as technology has progressed, the filmmaking has gotten better, but that doesn't mean that there wasn't a great film made before 1970. Back in the old days, filmmakers had to rely on cunning and skill instead of computer-generated special effects. Yes, some of these techniques might be considered hoky today, but there is still value in appreciating the history of film. Don't worry, this isn't one of those "Get off my lawn" posts where I tell you that life was better before the advent of cell phones and the Internet. It was, but I digress. No, this review is for the recently released Universal Classic Monsters: Complete 30-Film Blu-ray Collection. That's right thirty of the most influential horror films ever made including Bela Lugosi's Dracula and Boris Karloff's Frankenstein. The films are augmented by a vast trove of special features including documentaries, featurettes, audio commentaries, a 48-page collectible book, and so much more. Universal released the DVD version of this collection in 2016 and a very curated Essential Collection of six films in 2013. The trailer below showcases the highlights of the Essential Collection at that time. For many of the films in this collection, this collection represents their debut on the superior Blu-ray format. For others, this massive collection is a way to rediscover forgotten films that may have slipped through the cracks such as The Invisible Woman, She-Wolf of London, and The Creature Walks Among Us. The complete list of films in the collections are listed below. My only real complaint about this collection is that it includes the 1943 version of Phantom of the Opera instead of the 1925 Lon Chaney silent film that is far superior in my estimation. It would fit into the collection more seamlessly to me, but Universal lost the rights to the film when they failed to renew the copyright in 1953. This version of Phantom of the Opera is said to have launched this entire franchise of horror films at Universal, so its absence is a bit jarring to us true film buffs. That's not a knock on the Claude Rains 1943 version of Phantom of the Opera, but it is, in my opinion, a far inferior film. But, this one slight should not deter you from purchasing this impressive collection. As I mentioned, finding these films on today's streaming services are next to impossible and they will only become even more scarce as time passes. There are certainly benefits to a good streaming service, but archiving our film history is not one of them. As we approach the Halloween season, this collection would be a wonderful gift for any film buff, especially one that appreciates horror movies. A fun activity for October would be to take one film each day and watch it. After the viewing, you can share your thoughts on social media. These are the types of films that more people need to watch and I am just thankful that Universal continues to make this possible through physical media. Heck, maybe I'll take the Universal 30 Monsters in 30 Days challenge. 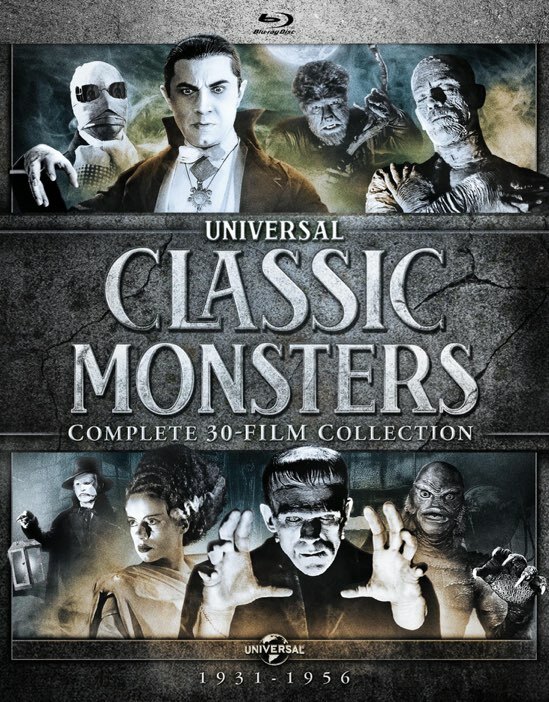 Universal Classic Monsters: Complete 30-Film Blu-ray Collection is now available for the suggested retail price of $149.98.